Prof. Dr. Otto Schmiedeknecht was a German entomologist who specialised in Hymenoptera. He was born September 8, 1847 in Bad Blankenburg, Thüringen, Germany and grew up in the town Stadtilm. When he was a young boy his father, Johann Friedrich Schmiedeknecht a “Rektor” (the head of a German university) would take him with him to animal observations. In 1861, he attended the Gymnasium in Rudolstadt and in 1868 the University of Göttingen were he studied science and modern languages. After the Franco-German war in 1870, which he took part as a volunteered, he returned home and finished his studies. In 1872 he received a job as a teacher of natural history and modern languages ​at Kahla (Thuringia, Germany) were he began his scientific work on Hymenoptera. In Jena, a German university town, he earned his doctorate with the famous Ernst Haeckel with a thesis on the genus Bombus. A year later he married his wife Hede and they moved to Blankenburg. Dr. Schmiedeknecht travelled and researched a lot, especially in the Mediterranean region. He visited the Balearic Islands, the Greek Ionian island of Zakynthos, North Africa, Egypt, Palestine, Java in Southeast Asia ect. 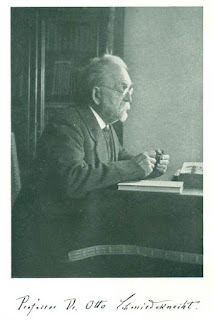 In 1903 Dr.Schmiedeknecht was the successor in the office of the Custodian of the Natural History Museum in Thuringer Landesmuseum Heidecksburg. In recognition of his scientific achievements, the city of Blankenburg gave him on the occasion of his 80th birthday (1927) the title of “honorary citizen”. On February 11, 1936 Professor Dr. Otto Schmiedeknecht died in his home, Schwarzenburgerstrasse No 5, Blankenburg. He left to future generation a large number of publications and preparations and his life's work was the treatment of parasitic wasps in the about 45 books of "Opuscula Ichneumologica". 1902-1936. Opuscula Ichneumonologica. Blankenburg in Thüringen.1902pp. 1907. Hymenopteren Mitteleuropas. Gustav Fischer. Jena. 804pp. 1914. Die Schlupfwespen (Ichneumonidae) Mitteleuropas, insbesondere deutschlands. In: Schoeder C. "Die Insekten Mitteleuropas". Franckh'sche Verlagshandlung, Stuttgart. pp. 113-170. Short-haired bumblebee queens due for release tomorrow morning! Bumblebees of the world - Natural History Museum, U.K.
Bumble Bee Watch - U.S.A. Bees Wasps & Ants Recording Society - U.K.
Bumblebee Conservation Trust - University of Stirling, U.K. The Short-haired bumblebee project - U.K.